CHARLOTTE, N.C. (AP) — JJ Redick jokingly bet new 76ers teammate Jimmy Butler on the bench that he wouldn’t call “game” on the final shot. 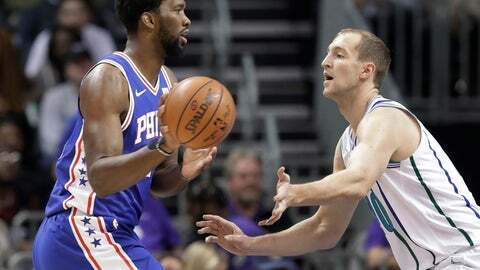 Butler, in his third game with his new team, drained a 3-pointer as time expired in overtime and Philadelphia overcame an NBA season-high 60 points from Kemba Walker to beat the Charlotte Hornets 122-119 on Saturday night. Walker’s 60 points were a career high and topped Klay Thompson’s 52 for Golden State against Chicago on Oct. 29 for most in the league this season. But the two-time All-Star was noticeably upset after the game about the team’s third loss this season to the 76ers, two of which have come in overtime. Walker had 37 and 30 points in his previous two games against the 76ers, but only shot a combined 33 percent. This time he was making everything, including banking in a 3-pointer to give the Hornets the lead with 44 seconds left in regulation after they had trailed by 17 earlier in the game. Walker held up his palms and shrugged his shoulders after the ball went in, similar to that famous gesture by Hornets owner Michael Jordan many years ago with the Bulls. But while Walker had the big numbers, Butler made the big plays. Along with his game-winner, he also blocked Walker’s shot on a drive with 15 seconds left and then saved the ball from going out of bounds. Walker thought he got fouled, but it wasn’t called. “That was an incredible 20 seconds of Jimmy Butler,” Brown said. As for the game-winner, he said it’s a shot he practices often, and worked on it 50 times earlier that morning. Butler scored 15 points and said he is adapting well to his new teammates. Embiid finished with 33 points and 11 rebounds and Ben Simmons had 23 points, 11 rebounds and nine assists as the 76ers defeated Charlotte for the third time this season. Larry Johnson, Alonzo Mourning, Glen Rice, Muggsy Bogues and Dell Curry were among those on hand as Charlotte celebrated its recently selected 30th anniversary team. Walker, the Hornets’ all-time leading scorer, was also a member. 76ers: Redick finished with 23 points, including two key jumpers in overtime. … Simmons threw an alley-oop pass to a breaking Butler from three-quarters court. Hornets: Nic Batum, who has struggled of late, was booed by the home crowd after an airball in the third quarter. He didn’t score in the game and only played two minutes in the second half. … James Borrego picked up his first technical foul as Hornets coach. … Marvin Williams and Cody Zeller fouled out.